After a couple of rough years, the Pittsburgh Steelers seem to finally have a running back they can turn to in La’Veon Bell. 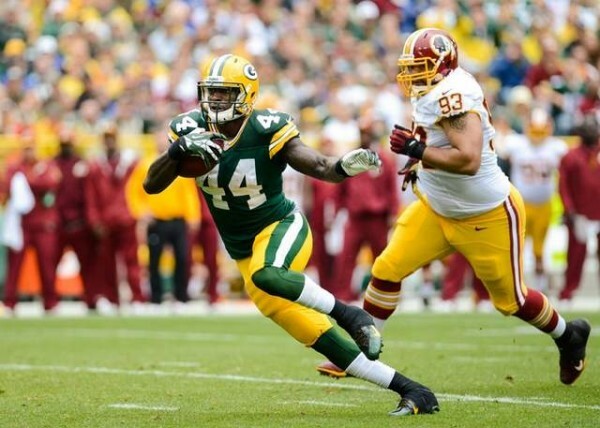 However, there’s nothing behind him, which makes James Starks, after four seasons with the Green Bay Packers, an excellent and proven option as his backup. Starks, 28, has been with the Packers since they took him as a sixth round pick in 2010. Injuries have always gotten in the way of him fulfilling his potential, but he’s done quite well when he has touched the ball, averaging 4.4 yards per carry throughout his career, including 5.5 last season, carrying the ball 89 times for 493 yards. With the Packers going all-in on the Eddie Lacy promise, there’s no real reason for them to pursue Starks in free agency, seeing himself as someone who deserves to compete for a starting job. Maybe his averages suggest he has the talent, but the injury history compared with the workhorse perception of both Bell (1259 yards last season) and Lacy make Stars seem like a backup, nothing more. But every team, even with a star, feature back, needs someone to take some of the pressure off. Starks might not realize it yet, but with the kind of interest and offers he’ll be getting through his visits and touring in this free agency period, he’ll soon realize that the best thing that can happen for him is simply signing for a team like the Steelers, knowing that any kind of big effort and workload might result in another injury, from which it’ll be harder to get another NFL gig in the future. There’s still an option for the Packers to re-sign Starks, but only if he comes to his senses and realizes there’s no market for him as a starting running back anywhere. Teams are wart of running back in general these days, and especially injury-prone ones who think they deserve to get a lot of carries and snaps.